Get an insider’s look at Downtown LA on this private, 2-hour walking tour. Discover top landmarks spanning the city’s Bunker Hills, Historic Core, Civic Center and Jewelry District neighborhoods, marveling at gorgeous buildings and enjoying scenic views along the way. You’ll also have the chance to admire the city’s Grand Park and LA City Hall, explore Grand Central Market and Pershing Square, see iconic Walt Disney Hall and Ahmanson Theater, and take a glance at incredible interiors of timeless Bradbury Building and Biltmore Hotel. Start with a fresh complimentary coffee. Your private, local guide will discuss the tour itinerary with you at the beginning of the tour. This tour can be customized to make it a unique experience for you. Start your fabulous day, as well as La La land’s exploration in Pitchoun Cafe, the coziest French bakery with a beautiful patio. Meet your private guide outside the café. Enjoy a complimentary freshly-brewed coffee before the tour and get ready for the fascinating journey. 10am Venture to the prominent Pershing Square, modern Spanish-style plaza, named for U.S. army General John Pershing. Immerse yourself in the luxury of timeless Biltmore Hotel, once the “largest and grandest” hotel west of Chicago, home to the 8 early Oscar ceremonies and witness of the rich Hollywood background. Pass by voguish Bunker Hill district and take a look at two vintage orange and black rail cars Sinai and Olivet which have been carrying passengers through the shortest funicular railway on the planet. By the way, the iconic Angel’s Flight is a 116-year old route and is recognized as the most traveled railway in the world. 10:30am Next, proceed to renowned Homer Laughlin Building famous for housing vibrant Grand Central Market for more than 100 years on its first floor. Soak up the electric atmosphere strolling through its numerous grocery stalls and get impressed by comprehensive variety of food to please any taste. Your walking tour through the city’s eclectic Historic Core neighborhood would not be complete without visiting fantastic Bradbury Building. Check out its outstanding interiors as your guide entertains you with fun and mysterious tales about history of its construction. 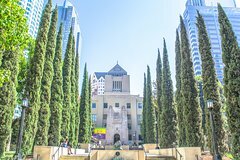 11am From there continue to the city’s Civic Center, eye up to spectacular Mid-Century state buildings and learn about notable benchmarks of the history of the area. Feast your eyes at LA City Hall, arguably the city’s most recognizable architectural monument. Escape the crowded LA streets wandering along the Grand Park, nice green oasis to relax and meditate. 11:40am Take a short stop at Public Library, magnificent creation of the famed American architect Bertram Grosvenor Goodhue. Before you conclude your trip, you’ll also get to visit the famous Jewelry District, for nearly a century home to hundreds of small shops and manufacturers selling everything from diamonds to precious gems to gold and silver. 12pm Your fast-paced tour will end at Don Francisco’s coffee Casa Cubana, lovely coffee shop where you can indulge in a refreshing Cuban coffee and fresh pastry.